As the weather starts to warm up, thoughts shift to outdoorsy type activities. Maybe you enjoy hiking or biking, or just want to take a leisurely stroll. You know what the ideal weather situation is for your personal taste, but how do you know if now is a good time to take the dog to the park, or if the temperature will be better suited for the occasion later in the day? The new look these days is flat, colorful, and simple. Foresee does not stray from the trend. The app is full of attractive icons, pretty round buttons, and is as flat as a pug’s nose. It fits right in with the design themes that we will see in iOS 7. Set up is simple. Just tap on an activity and select the details from a movable scale. Swipe from left to right to see all activities, tap the current location to add a different city. Tap the forecast to see details on the weather conditions and post the news to Facebook and Twitter. The first thing you will want to do is select an activity. 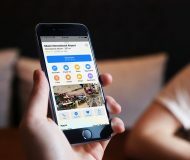 There are 72 different ones to choose from, ranging from simple tasks, like walking the dog or cycling, to more obscure outdoor hobbies, like archery or orienteering (does anyone even know what orienteering is?). Each activity is designated by a color, but you can change that by swiping the screen one direction or another. The background of your activity will gradually change hue across the color spectrum giving you nearly unlimited options. For example, if you start out with a bluish-red background, swipe from right to left on the screen to gradually add yellow to the mix, turning the background into an orange-red color. After you’ve selected an activity, add your ideal time. If you prefer jogging early in the morning to running in the evening, add the time frame starting at your ideal hour. 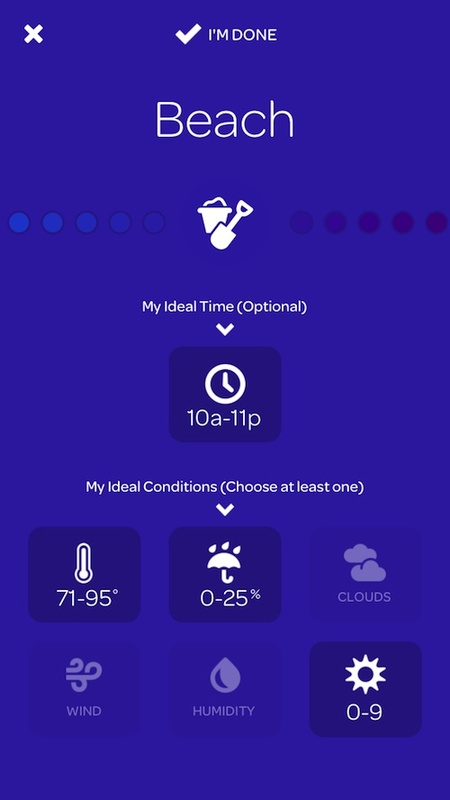 The app lets you add a two-hour window for your ideal activity time. The next step is to add your ideal weather condition. You can choose three categories from a selection of six, including temperature range, rainfall, cloud coverage, wind, humidity, and UV index. Each category includes a sliding scale that lets you select your ideal condition from one extreme to another. For example, under the Humidity category, you can select 0 – 100 percent humidity. I have no idea why anyone would find 100 percent humidity to be ideal for anything, but the option is there. After adjusting your perfect activity conditions, tap the “I’m done” tab. Repeat for every activity you think you will want to do, ever. There is no reason not to add skiing and snowboarding to the list now. You’ll be on the mountainside soon enough. Once your activity log is full, add a location. Tap the current location tab to add any city you like. Then, when you are planning a trip or just heading to the city for the day, you can check out weather conditions in that area. This feature is great for me. I live in Sacramento, where it gets into the triple digits in the summer. However, less than 200 miles away on the same day, San Francisco will be 30 degrees cooler. If I have plans to go on a picnic at Golden Gate Park, I won’t be caught without a coat. So, you’ve got your activity log filled and all possible locations added. All you have to do now is plan to go outside. If you want to make sure you mow the lawn before it gets too hot, check your activity log to see the best time in the morning to avoid breaking a sweat. If you are hoping for a swim in the pool, see when it will be the hottest so you can take advantage of the cool waters. To see hour-by-hour details of a given day, tap the “View Forecast” tab. Here, you will see the current or predicted weather for that hour and your preferences. 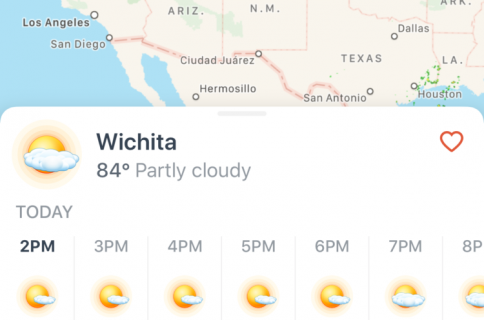 For example, if you select the forecast for 2:00 p.m., the temperature may be 90 degrees, but your preference is for 80. You can also post the weather condition for a particular hour to Facebook and Twitter. Looking for someone to go on a hike with? Post the weather to Facebook and see who wants to join you. You’ll be ready for any outdoor activity on any day in any city with this app. This app is easy to use. Once you’ve set up all of your favorite activities, and even not-so-favorite activities, you’ll be prepared for the outdoors. I like being able to finetune my ideal weather conditions. I have a very low tolerance for the cold. Basically, if it is less than 70 degrees outside, I’m staying in. This app makes it easy to see the best time for me to get out and do stuff. 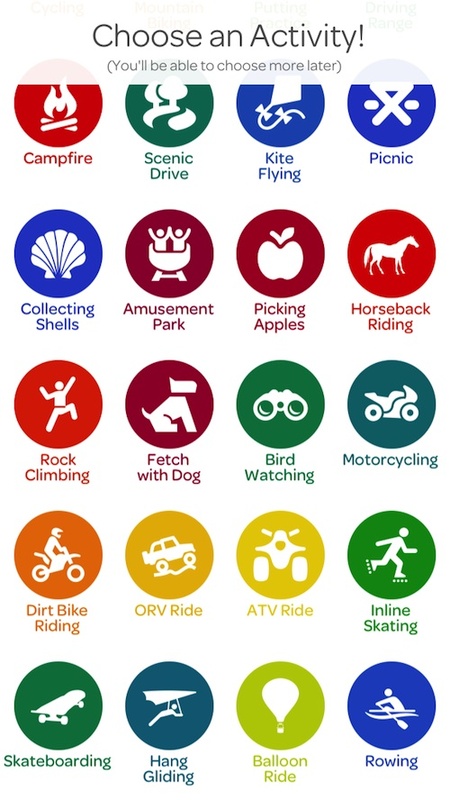 Even though there are 72 activities to choose from, you are still limited in your choices. I think there should be a custom feature that lets you create your own activity. There could be a couple of generic icons to pick from, but you would be able to label your own activity. For example, I like to go to the river on the weekends. I also like to go to the farmers market on Sundays. These are activities that I wish I could add to my list. 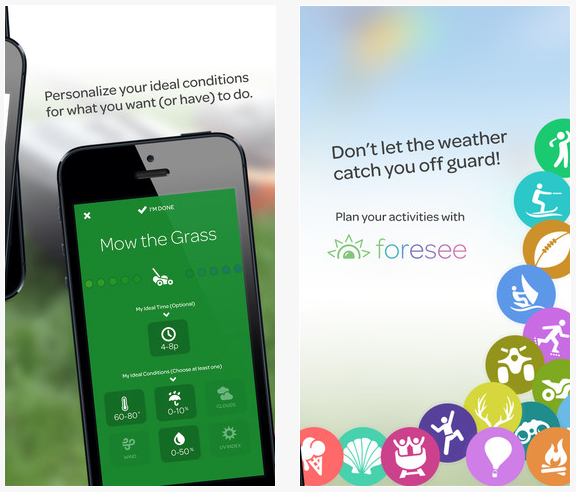 Foresee is only $0.99, which is the ideal price for a weather app. You won’t be getting real-time updates or Doppler radar images, but you will be able to better plan your daily outdoor activities. 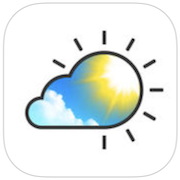 This is not a full-featured weather app. So, if you already have a favorite, this will not replace it. I’d even say that it is less of a weather app and more of a planning app. You’ll get updated information on the daily forecast, but not the epic weather data that some of the others in the genre offer. This app is good for its novelty and clever execution. It is also a fun way to determine what you’ll do outside on any given day. 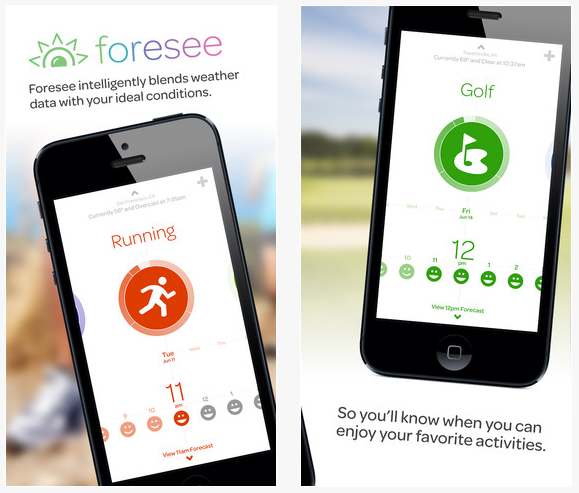 Foresee is available for the iPhone, iPad and iPod touch. You can download it in the App Store today.